This easy homemade Greek Vinaigrette is so light and fresh tasting! It’s perfect for Greek salad, but is delicious on any salad and it even makes a flavorful vinaigrette for roasted potatoes! All you need are lemons, olive oil, dried oregano, salt and pepper to make this tangy homemade salad dressing. I am back again this week with another easy, homemade salad dressing. 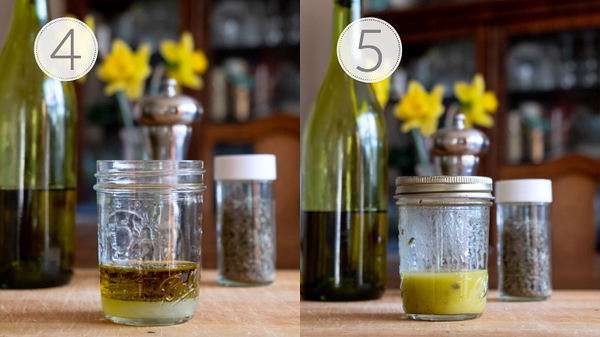 You all loved my easy Lemon Vinaigrette so much, I decided to do a whole series on the vinaigrettes and salad dressings that are on regular rotation at our house. When I posted the Lemon Vinaigrette, I worried because it was so simple. But then, someone emailed me saying that they had never tried making their own vinaigrette before, but mine looked so easy they were going to give it a try! Made me feel so good! I’m all about simple and easy. A recipe doesn’t need a bunch of ingredients to be good. 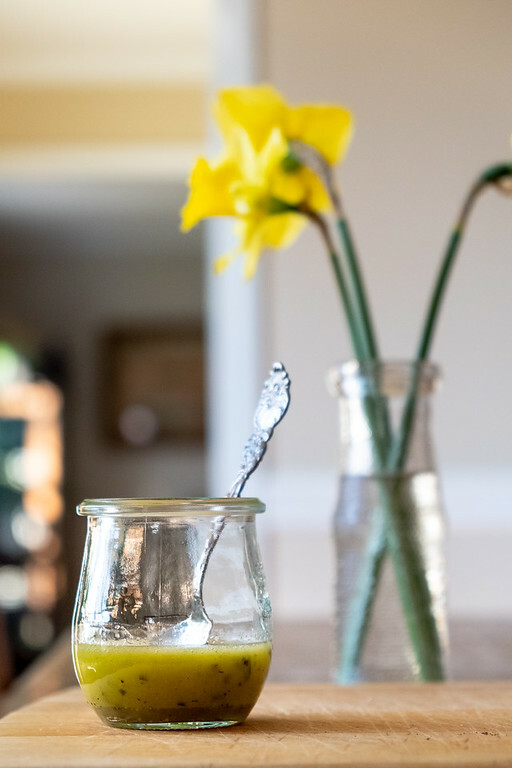 A vase doesn’t need a bunch of flowers to be gorgeous – just look at my old milk bottle with 3 sweet daffodils from my garden. I cherish that as much, if not more, than a big fancy vase filled with a dozen roses. Let’s embrace the simple, shall we? Let’s talk for a minute about the ingredients in this Greek Salad Dressing. Whenever you have such a simple recipe, with only a few ingredients, this is the time to use high quality, the best that you can find ingredients. Fresh Lemon Juice – do not use bottle lemon juice! Keep some fresh lemons around and this easy citrus press and you’ll have fresh lemon juice whenever you need it. Extra Virgin Olive Oil – use a good quality oil, not your everyday cooking olive oil. I like to try different brands that I find at Home Goods or Marshalls. Oregano – in almost all cases I prefer fresh herbs over dried. Oregano is the one exception. I think the dried has so much more flavor. Kosher salt and fresh ground black pepper – any kind of salt will do as long as it’s not table salt, which tastes so flat. We keep a pepper grinder filled with black peppercorns right next to our salt bowl. 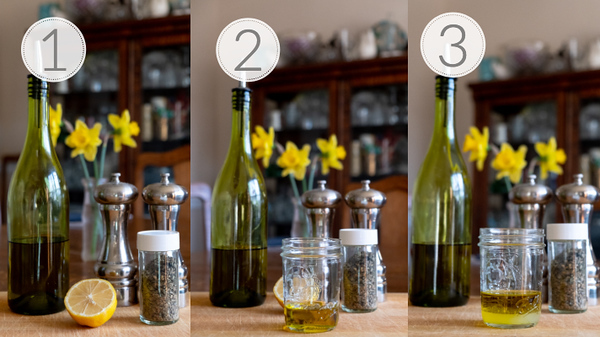 Step 1 – Gather your ingredients: olive oil (I keep mine in an old wine bottle with a pourer,) lemon, dried oregano, salt and black pepper. Step 2 – Add 3 tablespoons olive oil to a small jar. Step 3 – Add 1 tablespoon fresh lemon juice to the jar. Step 4 – Add dried oregano, salt and pepper to jar. Step 5 – Put a lid on the jar and shake to combine. 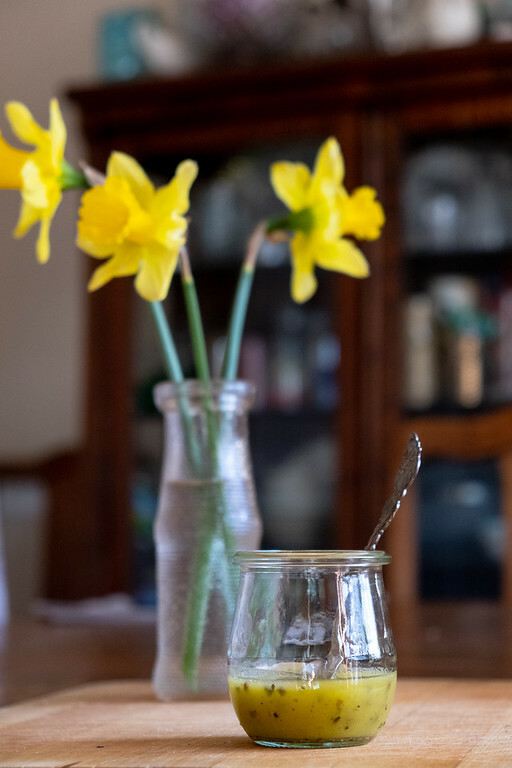 *Note – I make all my vinaigrettes in a jar, I feel they mix together better than just whisking, but feel free to put all the ingredients in a small bowl and whisk until combined. Greek Vinaigrette is so Delicious and Versatile! I love this Greek Vinaigrette! I’ve already had it on a couple of different salads. It was perfect on a Kale Greek Salad. I also discovered that it was yummy drizzled over some roasted potatoes! As a quick marinade for boneless, skinless chicken breasts it added a subtle lemon and oregano flavor. *Note I have used a traditional ratio of 3 parts olive oil to one part lemon juice in this recipe. You can play with the ratio if you would like more lemon flavor. If you’d like to receive an email when a new post goes live, just click here to subscribe! This easy homemade vinaigrette is perfect on Greek salads or any kind of salad! It's tangy and flavorful. Place all ingredients in a small jar and shake to combine. Alternatively, place ingredients in a bowl and whisk to combine. Fresh Lemon Juice - do not use bottle lemon juice! Keep some fresh lemons around and this easy citrus press and you'll have fresh lemon juice whenever you need it. Extra Virgin Olive Oil - use a good quality oil, not your everyday cooking olive oil. I like to try different brands that I find at Home Goods or Marshalls. Oregano - in almost all cases I prefer fresh herbs over dried. Oregano is the one exception. I think the dried has so much more flavor. Kosher salt and fresh ground black pepper - any kind of salt will do as long as it's not table salt, which tastes so flat. We keep a pepper grinder filled with black peppercorns right next to our salt bowl. Note - this recipe uses a traditional 3 parts olive oil to 1 part lemon juice. You can use play with the ratio of you want a stronger lemon flavor. I love how this vinaigrette is super easy, light and fresh, and only need very little ingredients. I love making my own vinaigrettes, but I tend to reach for the vinegar instead of lemon juice so I am definitely going to try this one out to mix it up as the warm weather approaches! I almost always use lemon juice now! I really needed a basic go to salad dressing like this. This sounds perfect for any green salad. I love making my own dressings from scratch so I know exactly what goes into them. Thanks so much for this perfect dressing! They are really so easy and it’s so nice to know all the ingredients! Oh this sounds divine! Sometimes easy and simple is better! Vinaigrette dressing is my most favorite of all the dressings on earth! Looks delicious, love the addition of oregano!